Hollister Premier Series Pouch with Belt Tabs is an ostomy pouch specifically designed for patients who have retracted, flush or recessed stomas. By providing increased security and protection for the skin, this ostomy pouch is equipped with a skin barrier, Flextend, with built in convexity to prevent the skin from irritating discharge. 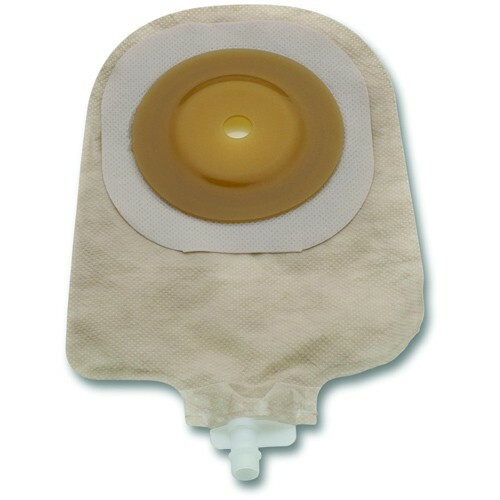 Available in both an option for a pre-cut opening or a cut-to-fit opening, this ostomy bag with skin barrier provides the optimal amount of comfort for users. Hollister Premier Series Pouch with Belt Tabs contains a comfort wear panel particularly added for the sole purpose of providing extra comfort to the patient. With a transparent odor barrier and rustle-free film, this pouch is the perfect solution for anyone seeking a discreet, odorless, noiseless and irritation-free pouch. You may also be interested in similar ostomy pouch products and supplies, such as Hollister Premier Series Drainable Pouch. Ideal for patients with retracted, flush or recessed stoma and provides increased security and protection for the skin with built-in convexity. Option for pre-cut opening or cut-to-fit opening to allow for the most ideal fit and optimal comfort during wear. Features a convex Flextend skin barrier and comfort panels. Quiet film transparent odor barrier and rustle-free film and pouch clamp closure make the entire unit discreet and quiet. Product numbers: 84711, 8474, 8478, 8480, 8481, 8482, 8483, 8484, 8485, 8486, 8487, 8488, and 8489. Unit of Measure: 5 per box.